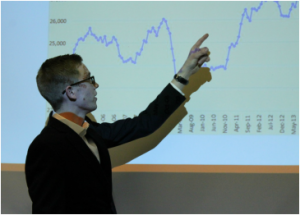 Commodity Investing by Students (COINS) is the only student-run commodities trading group in the United States and invests a portfolio of one million dollars of the Virginia Tech endowment in futures-based ETFs and ETNs. Trades are based on a combination of technical and fundamental analyses. COINS has a goal to outperform the Bloomberg Commodity Index (BCOM), a benchmark set by the Virginia Tech Foundation. In addition to providing invaluable, hands-on, educational experiences, COINS offers several types of scholarships to exemplary team members. The Holland family is recognized as a distinguished donor to COINS scholarships and funding. Aside from scholarships, several student members have also pursued commodity-related research with various faculty members and companies that visit and speak to the group. COINS attains 100% job placement. The group is divided into three divisions: Agriculture, Energy, and Metals (precious & industrial). COINS was established in August 2012 with a mission to provide educational experiences in tracking and trading within commodity markets while achieving a positive, risk-adjusted return for the Virginia Tech Foundation. The group was founded at Virginia Tech, in the College of Agriculture and Life Sciences and initially only investing in agricultural commodities. Since then, COINS has added positions in energy and metal commodities, thanks to generous funding from the Virginia Tech Foundation. COINS is also proud to represent a diverse group of students from the College of Agriculture and Life Sciences, the Pamplin College of Business, and the College of Engineering.